The number of CEOs who get terminated or lose their post at the top is stunning. Executive coach, author, and StyleMatters’ client Jen Shirkani reminds us that less than one-third of CEOs make it past three years; two in five CEOs fail in their first 18 months on the job. Why? 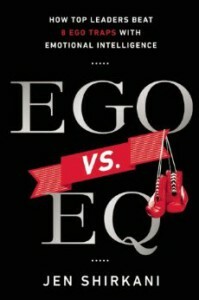 In her upcoming book Ego vs. EQ, Shirkani explores the eight most common ego pitfalls that cause CEOs to fall from grace. A small taste of these ego pitfalls—and the EQ antidotes that can save the day—can be found in “Why More CEOs Should Trade Ego for EQ,” Shirkani’s recently published article in BloombergBusinessweek. For the full scoop on how to avoid the eight common ego traps and thrive as a leader for the long-term, preorder your copy of Shirkani’s book. To learn more about StyleMatters’ book development, developmental editing, and ghostwriting services, contact us at info@style-matters.com.